Happy Wednesday everyone. Are you enjoying the Daylight Savings Time? I know that my family is. Today's card was inspired by the March Verve Diva Dare and many of the products I used today are from the Classy Cards N Such Online Store. The Diva Dare was to combine the styles of Diva Laurie and Diva Maureen into your creation. I love both of their styles and have several of their cards pinned on my Verve Inspiration Board on Pinterest. When I think of Laurie I think of several layers, soft colors, bling and distressed edges as in this card. When I think of Maureen, I see bright colors, big fluffy bows, buttons and bling, and a focus on the sentiment as in this card. So I set off to creating my card. 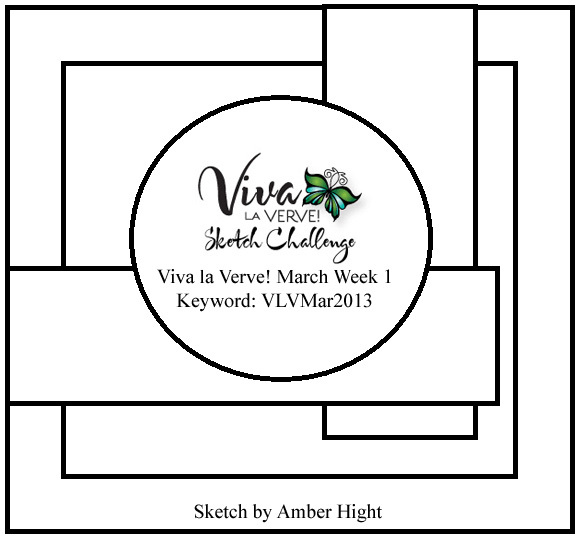 I started with the first Viva la Verve Sketch for March and rotated it 90 degrees to the right. It was no issue at all for me to distress, layer it up, or add bling. The real dare for me was to include a bow. Seriously I cannot make a bow if my life depended on it. I even have that tool, I think it's called Bow Easy. Bow Easy for who? Certainly not me. But, in honor of Maureen I pulled out the seam binding and set about making my poor excuse for a bow. Other than that I am thrilled with the way the card came out. The inspiration to use this particular sentiment from the Wonderfully Made Verve Stamp Set came from some struggles I've been facing with my health lately. It's encouraging and it speaks volumes about what God has brought me through. Thanks for dropping by. Have a blessed day. Beautiful!!! Love that butterfly on here and the gorgeous colors! Oh Sweetie, I so love this color combo, and the design is stunning! Beautiful card hun. Beautiful card Jennipher, I like the verse the colours and the butterfly. 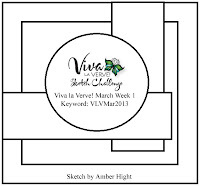 wow, this is gorgeous, I adore the butterfly and bling...so glad you took the Verve Diva Dare! Your card looks delicate and lovely! The pearls and other details are perfection. Such a beautiful inspirational card! This is beautiful! Loving the colors and the die cuts you used! This card is just stunning. The colour scheme you've chosen is so peaceful and warm. I love the little details you've added, like the bling. Great job with the sketch. Such a pretty card. I love the distress details on the card. So elegant and I love the colors. great job!! love the colors you used!! Hi Jennipher! Your cards are always so pretty...I love the layout on this one! Awesome work as always Hun & TFS!!! This is absolutely beautiful in pink! I love all of the shabby layers with the beautiful pearls, and the pretty butterfly! You bow looks wonderful!! 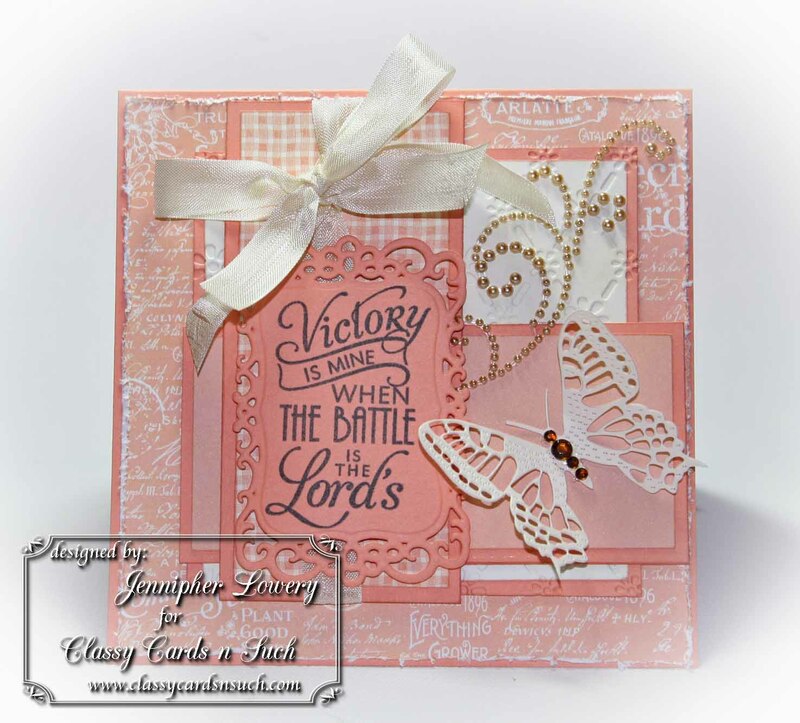 Jennipher, you nailed the color and sentiment on this card! Love that beautiful butterfly! Gorgeous card Jennipher. Love the pink and I see nothing wrong with your bow. Its a great bow. This is so gorgeous! Love the colors and the bling and butterfly. Fabulous layout.